SACRAMENTO — In the backyard of California’s Capitol sits Franklin Boulevard, a largely industrial area where many residents earn a living keeping old vehicles on the road. The state, which has been aggressively pushing toward an electric-car future, has made few such inroads in this working-class neighborhood. “Electric vehicles are for the rich. It’s not for us,” said Mike Bokan, who owns an auto-repair shop on Franklin Boulevard, explaining a prevailing attitude. The median income here is $30,000. One solution for making electric vehicles accessible to low-income Californians is coming from an unlikely ally: Volkswagen. In 2016, after admitting to lying about excessive emissions from its diesel vehicles, Volkswagen agreed to pay $14.7 billion in penalties. The settlement also earmarked $2 billion to be invested by Electrify America, a Volkswagen subsidiary, in building a nationwide network of highway chargers that allow long-distance road trips in an electric vehicle. But California, which will receive $800 million from that pool, is requiring 35 percent of the funds to be spent on low-income and disadvantaged communities. Among the first investments are three new all-electric, eight-seat shuttles that will be put into service along Franklin Boulevard — courtesy of Electrify America. Mr. Bokan, who is also president of the local business association, welcomes the shuttles, due by July. They will be a small relief from the exhaust coming from Highway 99, a diesel-choked trucking route that borders the area. Across town, Sarah Quismondo, a retired nursing staff coordinator, lives in Riverview Plaza, a low-income senior apartment complex. In a neighboring parking lot are two Kia Soul electric cars that are part of a car-share program that began in May 2017. The program provides free access to the cars, and Ms. Quismondo signed up right away. She was so enthused by the experience — “I love driving these cars, they’re very quiet,” she said — that she became an official representative of the program, Our Community CarShare. She signed up six other residents, and gives rides to fellow retirees at Riverview Plaza who no longer drive. 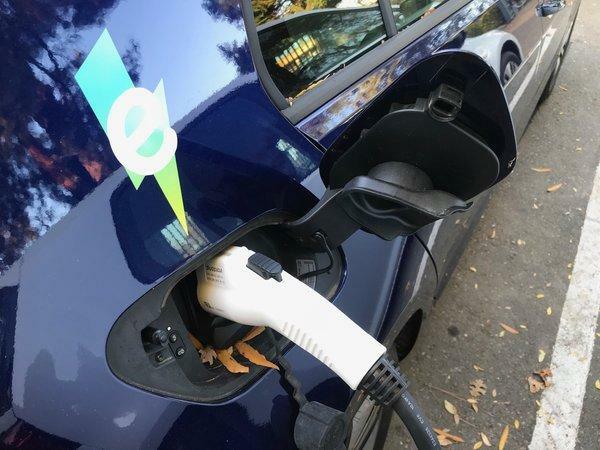 The program, run by the Sacramento Metropolitan Air Quality Management District, served as the blueprint for another Electrify America program in the city, just underway, to put 140 all-electric Volkswagen e-Golfs at 70 low-income apartment complexes for car-sharing. The air district’s boss, Alberto Ayala, is a longtime leader in California’s clean-energy efforts. His previous work as the chief enforcer of the state’s vehicle emissions regulations was instrumental in exposing Volkswagen’s diesel deceptions. After the scandal fully came to light, the company agreed to pay huge financial penalties worldwide, two Volkswagen executives were sent to prison — and Mr. Ayala’s city is now teeming with E.V. experiments. For nearly a decade, California has offered consumer rebates, as much as $7,000 per car, to make E.V.s more affordable. Since 2011, 15 residents of the 95824 ZIP code that surrounds Franklin Boulevard used the rebates. In the dense 95814 ZIP code where Ms. Quismondo lives, 71 did. The combined population of 40,000 in those two ZIP codes received $163,900 in state rebates. By contrast, in the affluent 94025 ZIP code, home to a similarly sized population — near Tesla’s headquarters in Palo Alto, Calif. — buyers received $2.4 million in rebates. Persuading people to use the e-Golfs stationed at low-income apartment buildings could be a challenge. They cost 15 cents a minute or $9 an hour to use. Mr. Ayala cited obstacles to adoption in his organization’s car-share program, which is free. He said many residents don’t have driver’s licenses or credit cards, which are needed to activate the service. I paid three visits to the Whispering Pines apartments, which was included in the service by Electrify America on Nov. 1. Each time, I found leaves collecting in the charging ports of the two cars, as if they had not been moved for several days. Envoy Technologies, which operates the program, declined to share usage rates for the cars at Whispering Pines. In yet another Sacramento-based experiment financed by Electrify America, a program called Gig this month started to put the first of 260 all-electric Chevrolet Bolts on city streets in a 13-square-mile zone between downtown and midtown. Seventy percent of residents in this zone are considered low income. Users can locate a Bolt via a mobile app, unlock the door, start it up and drive for $2.50 a mile or $15 an hour. When the ride is completed, members can park the car in any legal spot in the designated zone, lock the door and move on. These activities, which are have turned Sacramento into a test bed for equitable access to E.V.s, are being conducted in the first $200 million cycle of the Electrify America investment. The company says these programs have taken about a year to develop and won’t bear fruit until later this year. Even with few of those services fully in operation, Electrify America went back in December to the California Air Resources Board to get approval for the second $200 million cycle. The meeting became contentious when two board members, Assemblyman Eduardo Garcia and former State Senator Dean Florez, both hailing from rural districts, accused Electrify America of primarily focusing on profits, which it is entitled to earn under the Volkswagen settlement. Electrify America officials say the rural investment in the first two cycles is closer to $50 million, when considering the charging stations positioned at Target and Walmart stores and at other locations along highway routes, as well as urban charging hubs. After four hours of testimony from the public and board members, the state approved the second phase of the project. Mr. Florez cast the only vote against moving forward. He cited insufficient investment in rural areas, a lack of data about progress to date, and a broken promise to quickly approve a second city to join Sacramento in becoming a test bed. “I have a very serious issue with trust in the company,” Mr. Florez said in an interview. “People tend to forget why we got here in the first place,” he added, referring to Volkswagen’s emissions scandal. Electrify America also faces criticism from competing charging infrastructure companies, like ChargePoint and EVgo. They are unhappy to see a new, well-financed rival — with the state’s imprimatur and Volkswagen’s funding — for coveted public charging locations.